A couple weeks ago, back in the beginning of May, Debbie and I spent the weekend in Seattle where we visited Pike Place Market and spent a small fortune on seafood. We got the most ginormous lobster tails we have ever seen, a good chunk of halibut, a few handfuls of prawns (that were actually big enough to pass for small lobsters) and we got this beautiful salmon. It cost an arm and a leg, but it’s probably the best salmon I’ve ever had! 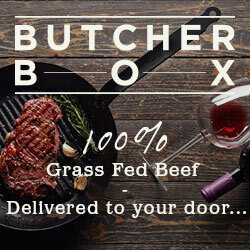 It was so juicy, tender and flavorful! When we were thinking about how to cook these fillets, we really wanted to make sure that we didn’t dry them out or overcook them. 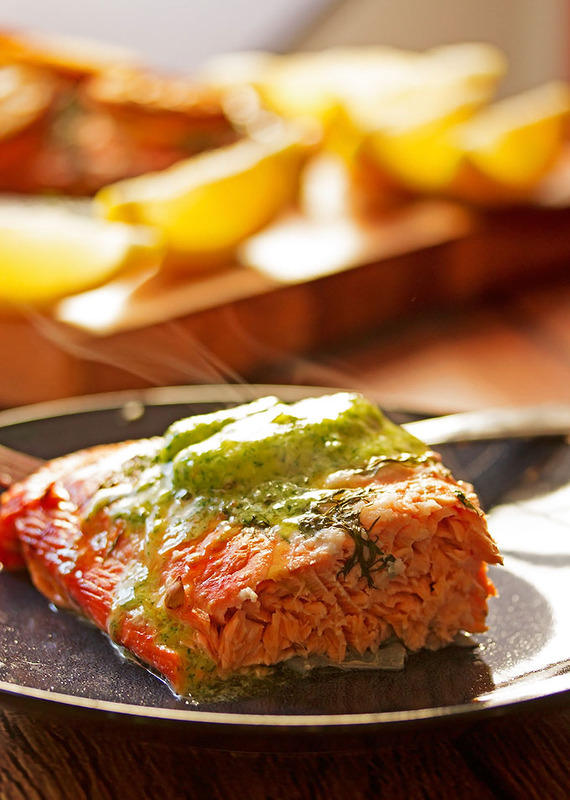 So we decided to barbecue them on maple planks so that while they cooked, they would get all that beautiful smoky flavor and the bottoms of the salmon would be protected from the harsh heat of the grill. I haven’t used this method of cooking very much at all but it has become my go to method for salmon. It takes just a little bit of preparation because you have to remember to soak the wood planks ahead of time. But if you have an expensive or even just a nice fresh piece of fish, this method is the way to go. It ensures a moist and tender dinner. It’s so disappointing when you accidentally overcook a nice fillet of fish and it dries out. I have to agree though, I will be making sure I always have some of this butter on hand in the freezer for when I cook fish. Even just a little bit will make any piece of fish so flavorful and tasty. If you served this butter with your meal at a dinner party, your guests will be super impressed. You could also use it on potatoes or even steak. Compound butter is that one little (and so easy) way to elevate your dish and class it up a bit. Make the butter by adding all the ingredients to a medium bowl and mixing well. Spoon the butter mixture onto a piece of saran wrap or parchment paper. Shape into a log, roll it up and throw it in the freezer to harden. Take it out of the freezer after 15 mins and keep it in the fridge till you are ready to use it. 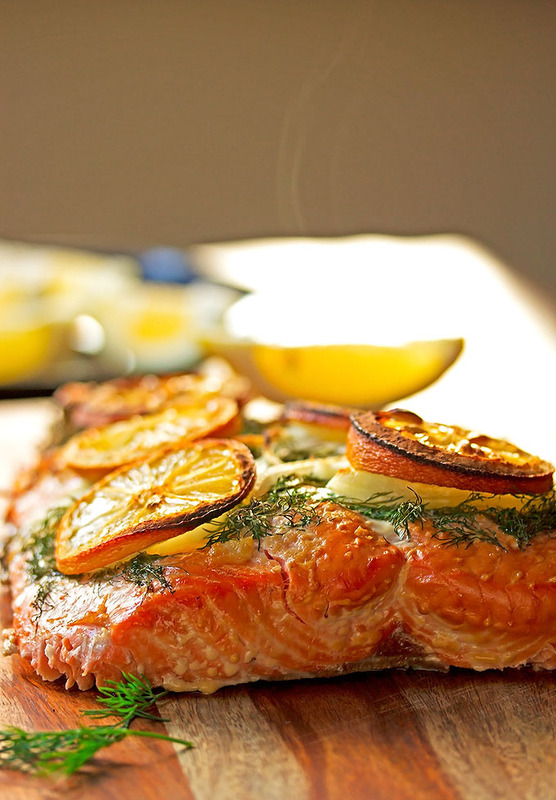 When you are ready to cook your salmon, heat your bbq to medium heat. 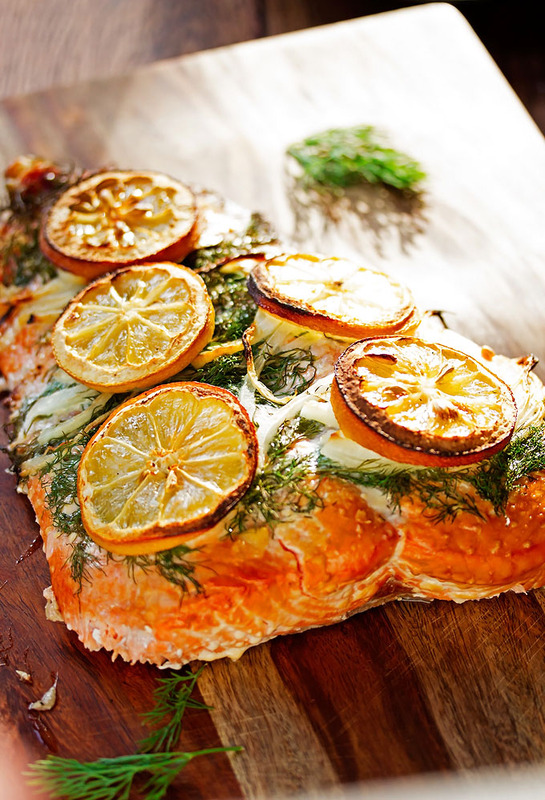 Place your salmon on the soaked wooden boards. Place the onions, dill and lemons on top. 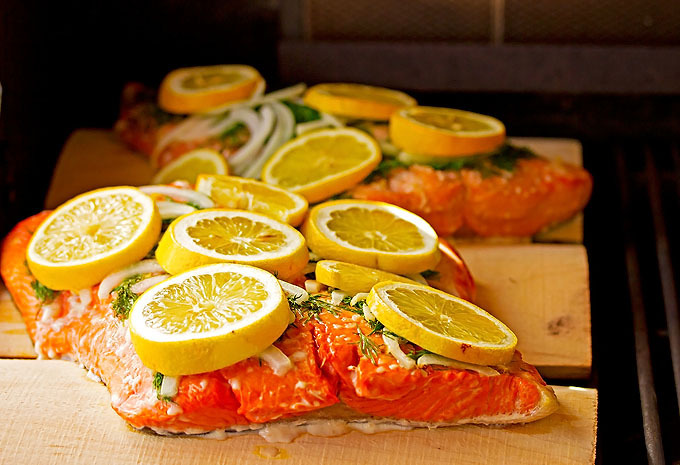 Put the wooden boards with the salmon on the bbq and close the lid. Make sure to keep checking to make sure the wood doesn't catch fire, but you want it to start smoking nicely. Cook until the fish is firm to your touch or use a fork to flake it a little bit in the thickest part to check if it is done. You want it to flake, but still be really moist. 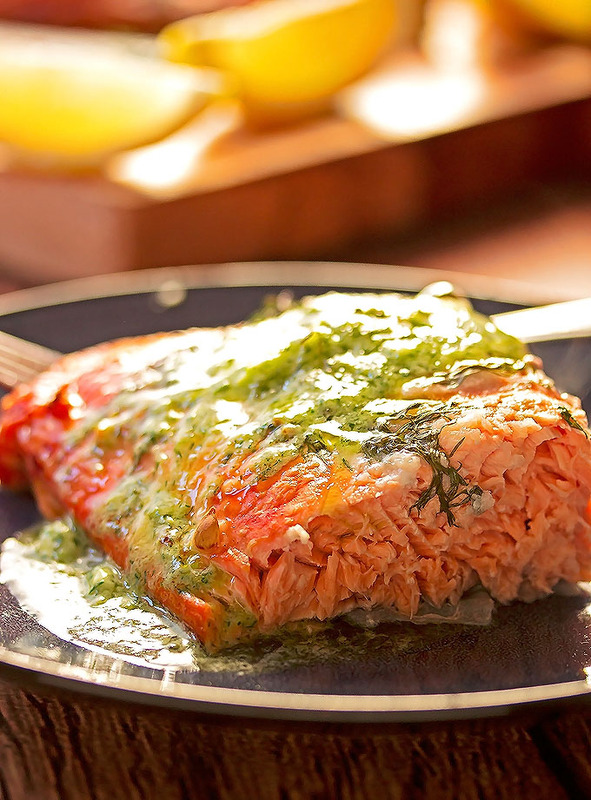 It will take about 10 - 15 mins per inch of thickness of your salmon. Remove from the bbq and serve right away with a slice of the compound butter on top. This sounds terrific. I just love compound butters. They are simple to do, have positively endless possibilities, and they add so much to a dish. Hi Adri! Agreed, compound butters are fabulous. I always have a few different ones in my freezer. Just had to comment this salmon dish you made. i just love the way you present it and the photo is outstanding. Hi Oli, thank you so much! 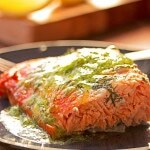 I love salmon so I like all recipe about salmon. Your recipe is really amazing and the photos are beautiful. I will try it. Thanks for your sharing. Hi Sal, I would serve it with some sort of rice pilaf dish and some steamed or bbq’d veggies (broccoli and green beans). Or some new potatoes tossed in butter and dill! YUM!